Flats (does it breed there annually? ), as was Clouded Yellow. Though 2014 produced neither the moth species diversity nor the number of individuals noted in 2013, there were still around 200 species including many highlights. Numerous species were recorded in the area for the first time, including the continental form of Crescent Dart, possibly only the second record for Essex, on 12 September. Our local specialities – notably some of the oak and broom feeders – did not disappoint, and the moth season was extended late into the autumn by the mild weather. 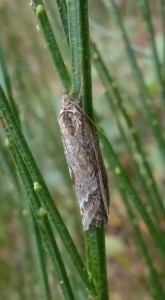 Rose Stephens managed to find several Streak moths (photo) on Wanstead Flats in November.